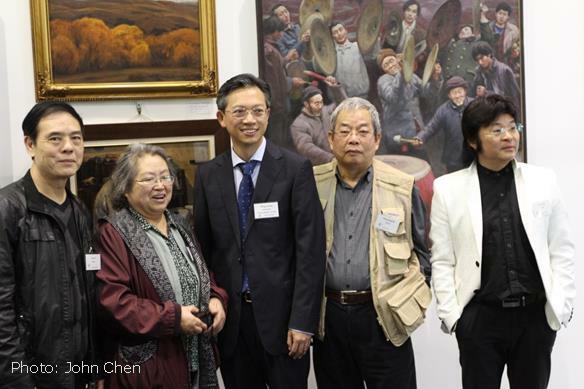 From left: artists Jim Lin and Lu Bo, Ambassador Wang Lutong, Dan Zeng and Deng Bangzhen from Auckland. ‘It was a conference where we worked hard on getting more youth involved in our Society and we witnessed the start of the Chinese Language Week concept. What however was important was how smoothly everything went’. ‘As I’ve already said I reckon Havelock North was a real success, particularly in two key respects – the excellent arrangements and the focus on youth’. ‘The conference was definitely wonderful, and I was impressed by the performance from Hastings Girls’ High School. 此致 (This is all I present to you) 敬礼(Warm Handshake)’. ‘Thanks for a great conference; I really enjoyed it. 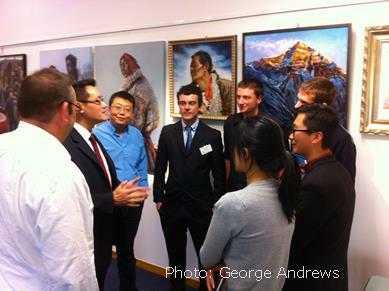 I thought the young people’s contribution in particular really stimulating and exciting; a good omen for the future’. 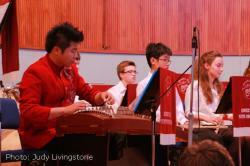 ‘It was certainly the best conference I have attended and I especially enjoyed the musical items from the young people of Havelock North and the Chinese instrumentalist’. A warm welcome to Hawke’s Bay for all delegates was enhanced by the Chinese flag flying in the centre of Havelock North village. The multi-purpose HN Function Centre looked stunning with a magnificent display of Chinese artwork, both paintings and sculptures, by artists Jim Lin, Dan Zeng, Deng Bangzhen and Lu Bo from Auckland. 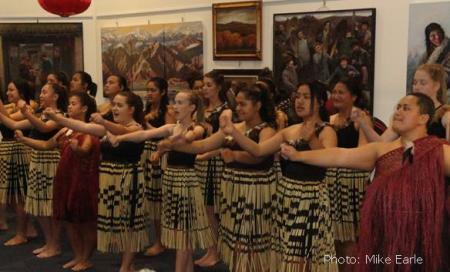 To introduce the Conference theme of ‘Voices for Youth’, impressive young women from Hastings Girls’ High School Kapa Haka group (right) gave us a memorable welcome performance. Napier Mayor Bill Dalton (right) spoke of the importance of China and our Chinese friends to all New Zealanders and then sat for his portrait by Deng Bangzhen. From left: Jan McLeod, Whanganui, Sook Hua Lee and Dave Bromwich, Hawke’s Bay, Raymond Huo, MP, and Tibetan artist Dan Zeng applaud Jim Lin far right after his painting demonstration. On Saturday morning, Ngahiwi Tomoana, Chairperson of Te Runanga o Ngati KahungunuTrust in his whaikorero extended a welcome on behalf of the six Iwi Taiwhenua in his rohe to all manuhiri present. He led us in singing the famous love song Pokarekareana composed by his grandfather Paraire Tomoana in 1917 that was inspired by his courtship of Kuini Raerena. Lawrence Yule, Hastings Mayor and President of Local Government New Zealand, formally opened the Conference stressing the importance of people-to-people contacts between China and New Zealand. 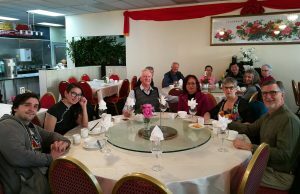 He affirmed the role of Hawke’s Bay Branch in assisting the Hastings District Council in its long-term Sister-City relationship with Guilin during the last 33 years. His Excellency WANG Lutong, Ambassador of the People’s Republic of China, warmly commended the Society on recent initiatives aimed at increasing youth participation and the importance of young people in China and New Zealand developing friendships for the future. Ambassador Wang announced that Jayson Zhang, husband of Consul General Tan Xiutian at the Christchurch Consulate, has donated $5000 to NZCFS from sales of his book, “The Beauty of New Zealand”. Jayson has asked the National Executive to allocate some of the money to Christchurch Branch projects. 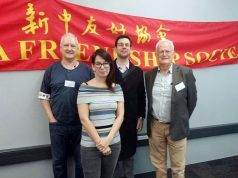 National President Dave Bromwich addressed the Conference on behalf of the Society and said NZCFS can be proud that two youth members Charles and Jessica Rowe (no relation), represented us at the 60th anniversary of Youxie (Chinese People’s Association for Friendship with Foreign Countries) on 14 -16 May in Beijing. Front row from left: Dan Zeng, Tibetan artist, Auckland, John Chen, Napier, and Mere and Ngahiwi Tomoana. Rear from left: Janet Kee, Napier, Professor Yang Xiaoqing, Confucius Institute Victoria University, and Jan McLeod, Whanganui Branch NZCFS. 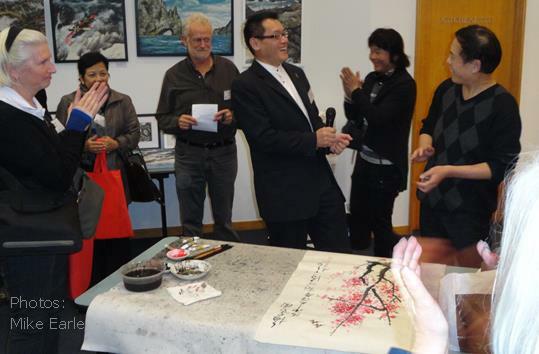 Raymond Huo, Labour MP, launched the national initiative New Zealand Chinese Language Week (NZCLW) to be held for the first time in September this year to develop public awareness of Chinese language and culture. The NZCLW Trust is co-chaired by Raymond Huo and Jo Coughlan, Wellington City Councillor, andother trustees are: Sarah Thomson, founder and president of the Waikato Mandarin Corner group; Neil Quigley, Professor of Economics and Deputy Vice-Chancellor, Victoria University of Wellington; Patrick English, Executive Director for the New Zealand China Council; and Dave Bromwich, NZCFS National President. Ngahiwi Tomoana, Chairperson of Te Ngati Kahungunu and his wife Mere together with guests waiata a Chinese folksong in support of New Zealand Chinese Language Week. NZCLW will most likely take place from 8-14 September. For more information click here. Above from left: Pat English, CEO NZ China Council, Raymond Huo, MP, Tony Tian (Christchurch), Jack Irvine and Kirk McDowall (Wellington), Hamish Young and Ken Liu (Auckland) & Faye Zhang (Wellington). 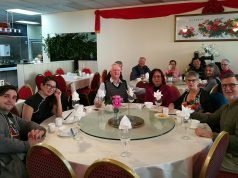 Sally Russell, host Branch President introduced the Conference theme of ‘Voices for Youth’ and invited Miao Fan, Hamilton Branch President, to facilitate our youth members inpresenting their vision for the Society’s future and in sharing a panel discussion. The Society’s first Youth Ambassador Charles Rowe joined the Conference via Skype from Beijing. Hastings Girls’ High School Principal Geraldine Travers gave an entertaining and informative address on their reciprocal student exchange experiences with the Zhong Shan Middle School in Guilin. She read a delightful report from Hannah Kupa-Elliott, aged 14, on her six-week Christmas exchange and experiences with home hosts and as a student. Geraldine advised that her school’s first teacher exchange was underway and they were looking forward to hearing about it. To complete Saturday afternoon, the Hawke’s Bay Youth and Training Orchestras under the leadership of Sue Melville and Charlotte Van Asch, presented a marvellous concert at St Columba’s Church, Havelock North. A feature was a splendid solo performance on the traditional Chinese instrument, the gu zheng, by Chen Xi Yao, a talented young musician from China. He composed a fusion piece called The River and combined with the orchestra to premier the composition for the first time. 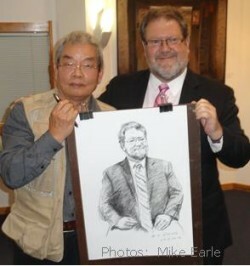 Thank you to: Sally Russell, Organizer & Mike Earle, Secretary; John Chen, artists; Irene & Heiko Lade, concert; Sue Padfield, Karen Cowley & Pam Yan, registrations; Lou & Janice Klinkhamer, decorations and raffle; Dave Bromwich, fusion food, special guests and Treasurer; Peter & Angela Free, Angela Chu, Irene & Heiko, Lou & Janice, Dave & Gaye and Mike & Sally for home hosting; Ken Jane for manning the foyer and others who helped; and Our sponsors, HDC International Advisory Group, Maimai Creek Wines, BNZ, Arataki Honey and St Andrews Limes. Award-winning novelist and poet Alison Wong has been selected to take part in an inaugural writers’ exchange with China this year. She will be the first New Zealand writer to join the prestigious Shanghai International Writers’ Program in September and October, run by the Shanghai Writers’ Association. About eight writers from all over the world are selected for the opportunity each year. They get free travel, accommodation in Shanghai, time to write and absorb the culture of the largest city in China. With more than 14 million people, the city is renowned for its historical landmarks but has also been a showcase of China’s economic boom over recent years. Alison is an established author who has received many awards for her work, including the 2010 NZ Post Book Award for Fiction for her novel As the Earth Turns Silver. She currently lives in Australia, although her writing is centred on New Zealand and she plans to return. A third-generation Chinese New Zealander, she will work on a family memoir while she is in Shanghai and hopes to be able to visit her ancestral villages in Guangdong for the first time before the residency begins. Alison is the daughter of Doris and the late Henry Wong from Taradale, Napier. 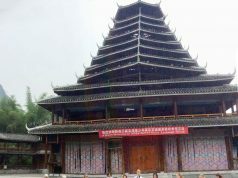 The residency is part of a writers’ exchange arranged between the Shanghai Writers’ Association, the NZ China Friendship Society, the Michael King Writers’ Centre and the Shanghai People’s Association for Friendship with Foreign Countries (Youxie). The exchange is the first of its type between China and New Zealand and follows on from the inaugural Rewi Alley Fellowship last year when a young Chinese writer, Huo Yan from Beijing, held a two-month residency at the Michael King Writers’ Centre in Devonport, Auckland. Next year, a writer from Shanghai will have a two-month residency at the centre. 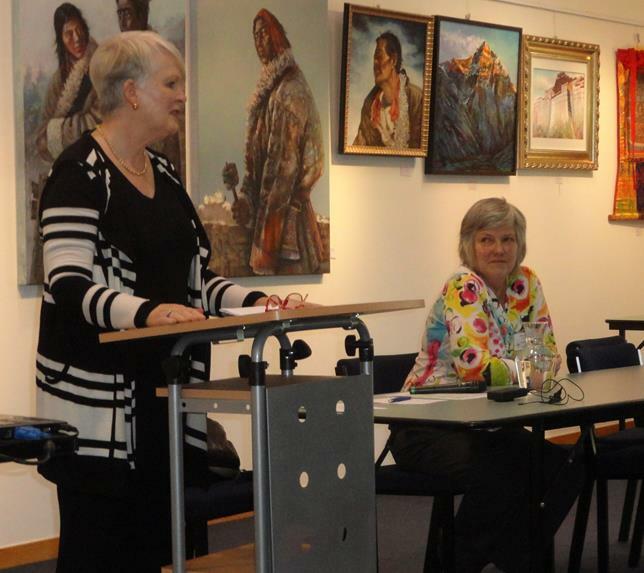 Eurasian playwright, poet and Radio New Zealand journalist Lynda Chanwai-Earle, daughter of Mike Earle, and author Jane Hole represented NZCFS on the selection panel. 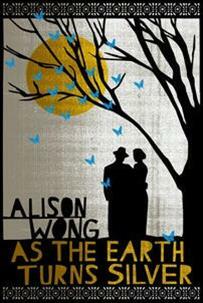 In her award-winning first novel As the Earth Turns Silver she tackles the lives of Chinese immigrants in the New Zealand of the early 20th century. 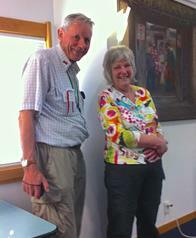 The book brings alive the city of Wellington in the early 1900s and the society, politics and attitudes at that time. Those who know the city will enjoy the references to familiar locations and streets. Chinese in New Zealand at that time were subject to racism, both official and personal, and the poll tax. 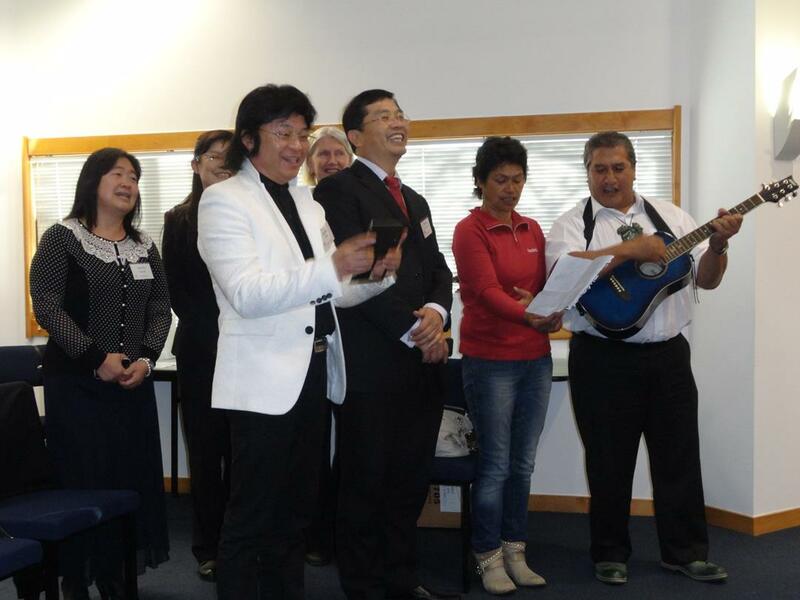 Chinese immigrants, predominantly from Guangdong in southern China migrated to New Zealand seeking a better life. The challenges of language and culture were ever-present. The novel explores the lives of two people whose paths cross: an immigrant, Yung, who works in a greengrocer’s and a local woman, Katherine McKechnie, struggling to bring up her two children on her own. As the Earth Turns Silver touches on issues of personal openness and courage as it traces the mixing of two cultures through the characters’ relationship. Around them events are changing the society they live in but some prejudices prove stubborn and difficult to overcome. The writing has a gentle and poetic style reflecting the author’s poetry background. It lingers on small things; flowers, fruit, and the light of the moon, as it shines silver on the water, while immersing the reader in the period. As the Earth Turns Silver is an enjoyable novel and thoroughly recommended to all with an interest in the history of Chinese in New Zealand. 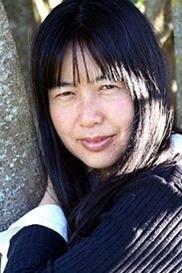 Alison Wong is also the author of a book of poetry entitled Cup, published in 2005. As the Earth Turns Silver is available from the Hastings, Napier and Taradale Public Libraries.